A golfer tees off the 10th hole Yampa Valley Golf Course Thursday. The course is hosting its largest tournament of the summer, the Cottonwood Classic this weekend. The tournament will play through Sunday evening, with food and entertainment over the weekend. First tee-times: 7:30 a.m. Fri., Sat., Sun. Last tee-times: 1:10 p.m. Fri., Sat., Sun. The Yampa Valley Golf Course began its biggest tournament of the year this morning, with the first golfers in the field teeing off at 7:30 a.m. 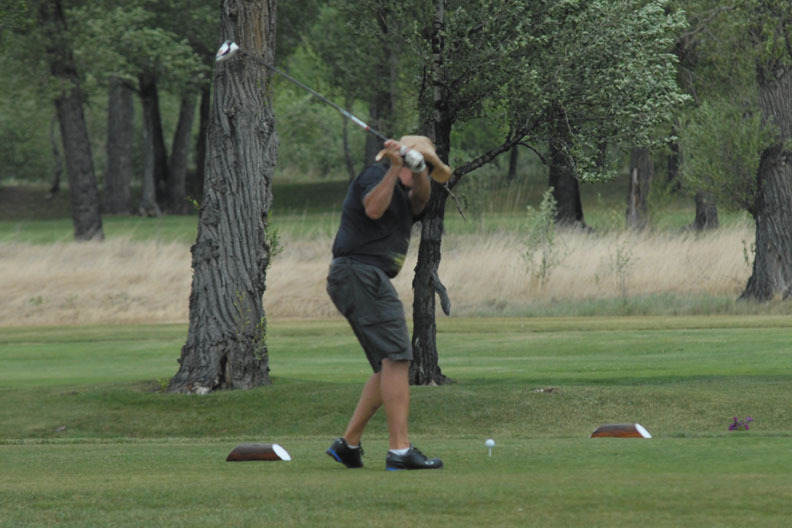 The Cottonwood Classic, an annual tournament at the end of June which attracts more than 100 golfers each year, kicked off a banner weekend for the golf course. Head golf pro Jason Back said there are 127 players in this year’s tournament field. They are broken up into seven flights, arranged by handicap level. The tournament is 54 holes of play, concluding Sunday. The final tee-times Sunday will be 1:10 p.m. The player with the lowest gross score will be crowned champion Sunday. Each day will also include a closest to the pin contest with prizes involved. Back said a great deal of preparation goes into the tournament, and it is nice to see it come together. “It’s about a three-week process to get everything ready to go. It’s the busiest tournament of the year,” he said. One of the big goals with the Classic from the club’s standpoint is to provide activities and entertainment during downtime for golfers coming in from out of town, Back said. The chipping contest will be a part of that, but the golf course will provide other entertainment as well. A Calcutta will take place Friday night at the clubhouse, where golfers and others in attendance can bid auction-style on the golfers they believe will win the tournament. It will also be a big weekend for the Tin Cup Grill, according to owner Gary Baysinger. The restaurant will offer live music from guitar player Don Johnson Friday and Saturday night, and will also host a barbeque dinner Saturday for the golfers. The warm, sunny weather is forecasted to stick around over the weekend and provide excellent playing conditions. Back is hoping there will be low wind, and he will be happy.